After sixty years of research, it’s conventional wisdom: as people get older, they stop keeping up with popular music. Whether the demands of parenthood and careers mean devoting less time to pop culture, or just because they’ve succumbed to good old-fashioned taste freeze, music fans beyond a certain age seem to reach a point where their tastes have “matured”. That’s why the organizers of the Super Bowl — with a median viewer age of 44 — were smart to balance their Katy Perry-headlined halftime show with a showing by Missy Elliott. Spotify listener data offers a sliced & diced view of each user’s streams. This lets us measure when this effect begins, how quickly the effect develops, and how it’s impacted by demographic factors. For this study, I started with individual listening data from U.S. Spotify users and combined that with Echo Nest artist popularity data, to generate a metric for the average popularity of the artists a listener streamed in 2014. With that score per user, we can compute a median across all users of a specific age and demographic profile. 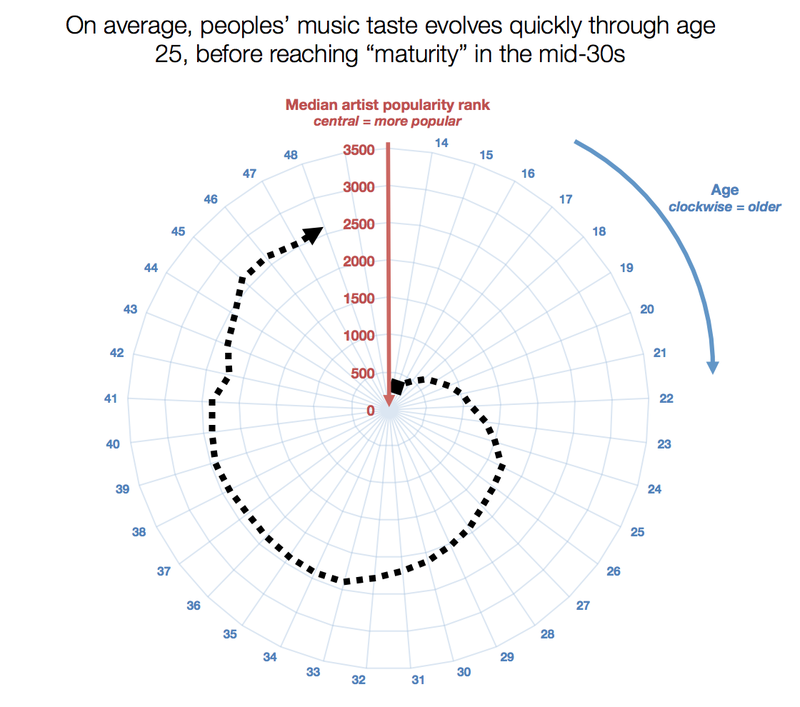 … while teens’ music taste is dominated by incredibly popular music, this proportion drops steadily through peoples’ 20s, before their tastes “mature” in their early 30s. … men and women listen similarly in their their teens, but after that, men’s mainstream music listening decreases much faster than it does for women. … at any age, people with children (inferred from listening habits) listen to a smaller amounts of currently-popular music than the average listener of that age. Personified, “music was better in my day” is a battle being fought between 35-year old fathers and teen girls — with single men and moms in their 20s being pulled in both directions. Spotify creates a “Taste Profile” for every active user, an internal tool for personalization that includes us how many times a listener has streamed an artist. Separately, we can marry that up to each artist’s popularity rank from The Echo Nest (via artist “hotttnesss”). 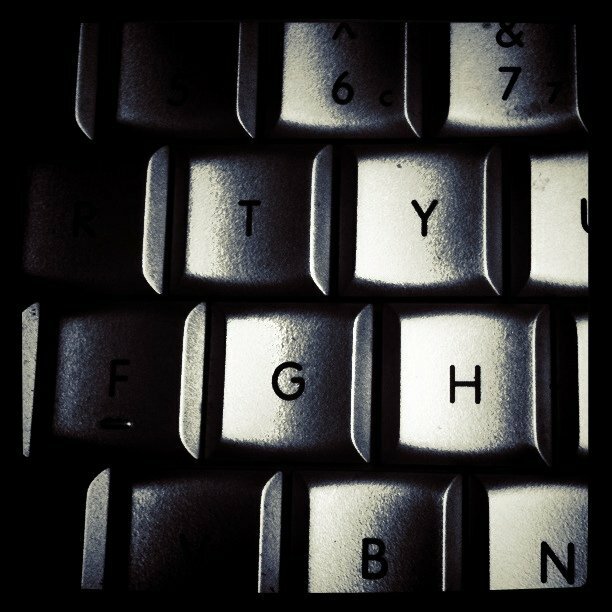 To cut down on cross-cultural differences, I only looked at users in the U.S. Thus, to find 2014 listening history for 27-year-old males on Spotify (based on self-reported registration data), we can find the median popularity rank of the artists that each individual 27-year-old male U.S. listener streamed, and calculate the subsequent median across all such listeners. DOES AGE REALLY IMPACT THE AMOUNT OF POPULAR MUSIC PEOPLE STREAM? 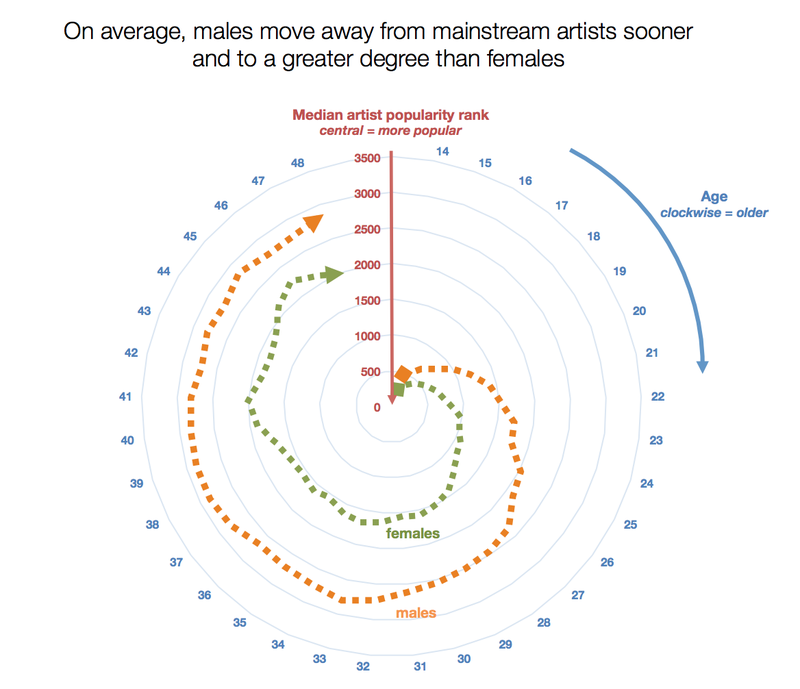 The Coolness Spiral of Death: Currently-popular artists lie in the center of a circle, with decreasing popularity represented by each larger ring. As users get older, they “age out” of mainstream music. Mainstream artists are at the center of a circle, with each larger concentric ring representing artists of decreasing popularity. The average U.S. teen is very close to the center of the chart — that is, they’re almost exclusively streaming very popular music. Even in the age of media fragmentation, most young listeners start their musical journey among the Billboard 200 before branching out. And that is exactly what happens next. As users age out of their teens and into their 20s, their path takes them out of the center of the popularity circle. Until their early 30s, mainstream music represents a smaller and smaller proportion of their streaming. And for the average listener, by their mid-30s, their tastes have matured, and they are who they’re going to be. While both genders age out of popular music listening, on average this effect happens sooner and to larger degree for men than for women. However, the decline in popular music streaming is much steeper for men than for women as well. Women show a slow and steady decline in pop music listening from 13-49, while men drop precipitously starting from their teens until their early 30s, at which point they encounter the “lock-in” effect referenced in the overall user chart earlier. The concept of taste freeze isn’t unique to men. But is certainly much stronger. DOES HAVING CHILDREN REALLY IMPACT THE AMOUNT OF POPULAR MUSIC PEOPLE STREAM? Many factors potentially explain why someone would stop following the latest popular music, and most of them are beyond our ability to measure. However, one in particular is something we can identify — when a user starts listening to large amounts of children’s music. Or in other words, when someone has become a parent. Spotify has an extensive library of children’s music, nursery music, etc. By identifying listeners with significant pockets of this music, we can infer which listeners are “likely parents,” then strip out those tracks and analyze the remaining music. 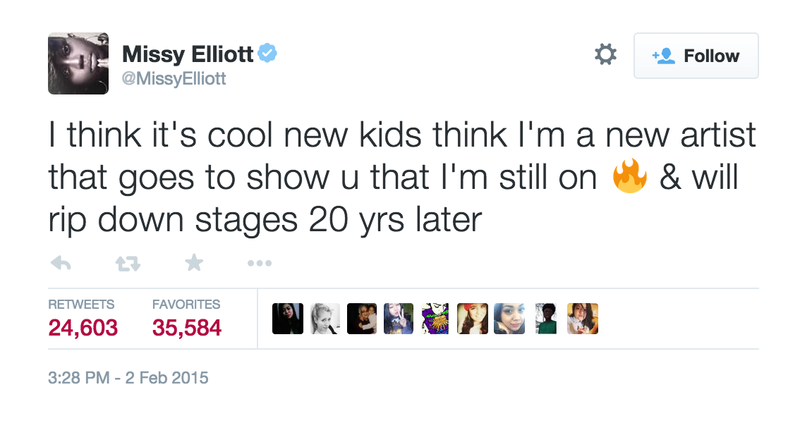 Does having kids accelerate the trend of aging out of music? Or do we see the opposite — i.e. that having kids in the house exposes a person to more popular music than they would otherwise listen to? The “musical tax” of having children: becoming a parent has an equivalent impact on your “music relevancy” as aging about 4 years. In fact, it’s the latter: Even when we account for potential account sharing, users at every age with kids listen to smaller amounts of popular music than the average listener. Put another way, becoming a parent has an equivalent impact on your “music relevancy” as aging about 4 years. Interestingly, when it comes to parents, we don’t see the same steadily-increasing gap we saw when comparing men and women by age. Instead, this “musical tax” is roughly the same at every age. This makes sense; having a child is a “binary” event. Once it happens, a lot of other things go out the window. All this is to say that yes, conventional wisdom is “wisdom” for a reason. So if you’re getting older and can’t find yourself staying as relevant as you used to, have no fear — just wait for your kids to become teenagers, and you’ll get exposed to all the popular music of the day once again! For this analysis, I wanted to isolate music taste down to pure music-oriented discovery, not music streamed because of an interest in some other media or some other activity. To that end, I eliminated any Taste Profile activity for artists whose genre indicated another media originally (“cabaret”,”soundtrack”, “movie tunes” “show tunes”, “hollywood”, “broadway”), as well as music clearly tied to another activity ( “sleep”, “environmental”, “relaxative”, “meditation”). 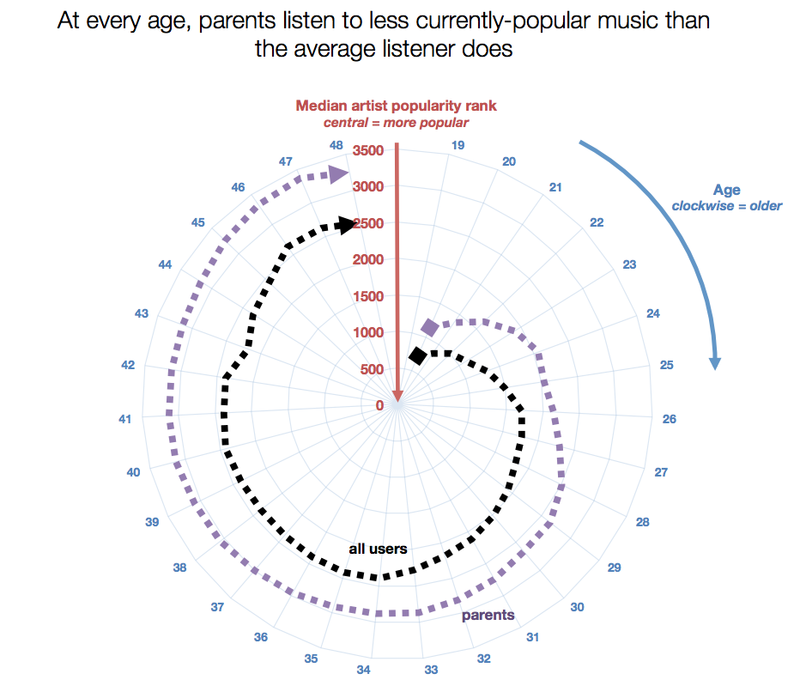 To identify likely parents, I first identified listeners with notable 2014 listening for genres including “children’s music”, “nursery” , “children’s christmas”, “musica para ninos”, “musique pour enfants”, “viral pop” or ” antiviral pop”, then subsequently removed that music when calculating the user’s median artist popularity rank. To control for characteristics across cultures, this analysis looked only at U.S. listeners. As has been pointed out in previous analyses, registration data by birth year has a particular problem in overrepresentation at years that end with 0 (1990, 1980, etc). For those years, I took the average value of people who self report as one year younger and one year older. Matching birth year to age can also be problematic depending on month of birth, so for the graph’s sake I’ve displayed three-period moving averages per year. This entry was posted in analysis, music. Bookmark the permalink. American pop culture — the reason I moved to Japan. Have no fear The Stones are still rolling !! Great work! Really enjoyed reading this piece. As someone who listens to classic rock as well as current music, I found this very interesting. Something I wouldn’t have thought to research. this is a very true post. I too believe that music was truly good back then. Really, really interesting. This kicked me to perform some other analysis! Interesting! Me and my son share music now and then. He hears a tune in a commercial and would like to know what it is, or I ask him the same. Recently it was a George Harrison tune. Does this include photography too? When and why do we stop challenge ourselves? If we do. The circle diagrams seem to overly complicate the presentation to no advantage as far as I can see. Why not use line graphs? I listen to A State of Trance with Armin van Buuren on Spotify. It’s a weekly show that plays new and upcoming trance. I discover new artists regularity, I’m 40. Does this mean I’m abnormal? I wonder how this phenomenon is impacted by Spotify and digital/streaming music technologies themselves? I’ve seen survey research from 10-15 years ago that suggested awareness of teen children’s music arose, but not preference or consumption – you knew the artists because the radio was on in the background, but begrudgingly so. It’s easier to explore your children’s music tastes a bit at a time via facilitated streaming, versus making a genre-wide decision based on a song here and there on the radio. iTunes, Spotify, et al, have also taken us ‘back to the future’, in that we’re once again consuming by the song rather than by the album. 2) identification of parents is seriously flawed. I am a parent, but never once have I ever utilized spotify to stream Laurie Berkner or nursery tunes. Ridiculous. 3) I can’t even handle how flawed this is, however, I will be using it in the class I teach on research methodology, because I love studies that lack generalizability and ignore possible confounding variables. So thank you. The research is quit entertaining but is it good? Does it ask the right questions? How many of us are actually interested in music? Are men in general more music interested than women? What do the high demand for popular music for young people say about their music interest? Are people looking for acceptance more likely to stick with pop music longer? Maybe a factor analysis of some sort could explain partly the questions above. Knowing that pop music gets less interesting with age is not news. I found this quite interesting, probably because my blog is based around trying to encourage my peers (those in their 50s or so) to keep going to live music, and to festivals (I’m in the UK). I still find plenty of people my age at festivals, psytrance eves, many at predictable gigs (Fleetwood Mac), a mixed audience at, say, War on Drugs. I also go to events where it dismays (but doesn’t embarrass) me to to find I’m one of the oldest (Hookworms gig, Field Day festival to name two), although Mazzy Star was at the latter, and they are ‘old school’!. This was a really interesting article. I find that now that I am a bit older I am starting to really appreciate and enjoy classic music. Music that was around before my time like soul music from the 60s, or popular artists like the Beetles. Where as when I was a teenager I had no interest in that kind of music, I only listened to pop music. It could be that I went to college for music and was exploring different genres but I really have found my self loving the classics. I still do listen to and enjoy pop music but it seems as pop music is so over played that I get tired of it. Absolutely fascinating, but scary to think that our listening progression is so predictable – is it a chemical, aging thing or just overkill of popular music that causes this road to more independent music choices? At first, it just sounded like men just lock into their old music, but reading this I realized you could interpret this is as men taste’s broaden sooner, and that is what you said. In high school, I probably did not listen to popular music to begin with, mostly preferring rock and the like. Eventually, I listed to more dance, AKA disco, but then rap, classical – because of a relationship – which evolved into house/electronica and jazz. As for the most recent op, if you can call it that, I spent months listening to Lady Gaga and Lorde. My tastes are broad, and I specifically search out new music via MetaCritic, Stereophile, ITunes, and AudioStream, but from your description, I fit the profile of someone who ‘matured out’ and stopped listening to pop music. Who knew, having broad, eclectic tastes in music meant I got old prematurely. Now, it is quite possible for the graph to be wrong for a variety of reasons. TW, thanks for this list. I was checking out the teens list on ITunes, and lots of it is really great, but the real pleasure came from using ITunes Pure Pop station on Radio. Very nice, Thanks for sharing. Could it actually be the other way around? That at our early days we are more attracted to pop-music than the actual average listener? To me, pop music = fast food. 1. both are basic and appeal to very deeply rooted though simple sensations, rather than complex and subtle ones. We all know it’s not subtle, delicate, but we still enjoy it for what it is: standard chords / simple rhythm or sugar / fat and characteristic smell. 2. both get sold and famous thanks to heavy marketing. I think this is why kids tend to be attracted to both pop music. Like fast food, it’s one of the first music not provided by their parents they will come across, it will have a taste of novelty, all their friends will also know it, and since they are looking for simple and intense sensations, more complex music they might come across will not fulfil their need for novelty. As one grow, it slowly calm down and enjoy the subtlety of complex rhythms and chords, as he/she enjoys different food than pasta, steak or fries. Being parent forces you to be more mature, so it’s not surprising parents listen less to pop-music. Now about the difference between men and women, I don’t think it’s related to the same thing. My guess is that music consumption is as much of a social thing as it is something personal. Women may naturally identify with female artists. Looking at what it takes for a woman to succeed in the music industry might provide some answers. Pingback: 나는 가진 노래들을 날렸다. Maybe I’ve misunderstood something but I think the conclusion “for the average listener, by their mid-30s, their tastes have matured, and they are who they’re going to be” seems to be a bit off based o the info I get from this article. I do believe we wander away from the most popular music with age, we don’t feel the same need to fit in, but I don’t think our taste freeze or “mature” in the way that we stay with the same unpopular artists and stop exploring. Isn’t it just that we start to explore even more but in lesser popular music areas? I can only speak for myself(and a bit for friends and family) but I believe that with Spotify people really have started to explore and listen to more “rare” music. Sure, most of my music is artists with a few hundred to a couple of thousand followers, I guess pretty unpopular, that is true. But i listen to new(to me) music everyday, I bet a majority of my listenings are songs I have never heard before. And when I talk to my friends, most of them says more or less the same. Spotify has given lesser popular artist a better chance to be discovered. I would bet my money on the conclusion that people are exploring music and changing their listening by their own choice more than ever before. If I missed something like data supporting that that adults get stuck in old patterns and just listen to same songs/artists over and over again, then I apologize for wasting anyone’s time with this post. lol, just saw that there already were 126 comments, plenty with the same thoughts!